Where can I find information on historical earthquakes? Where can I find information on current earthquakes? Where can I learn about earthquake safety & disaster preparedness? Where can I learn about retrofitting old buildings? How close are we to predicting earthquakes scientifically? Do large magnitude earthquakes affect the planet’s rotation and/or axis? Does the pumping of groundwater and California’s recent ongoing drought affect seismicity? Why do some earthquakes produce numerous aftershocks, while others produce few to none? What are some good seismology books to read? Are we falling into the ocean soon? Do large earthquakes (local or distal) trigger earthquakes elsewhere? Is the number of earthquakes increasing with time? Can animals, some people’s headaches etc. help predict earthquakes? Do all the small earthquakes relieve the stress so we won’t have as many big ones? What is the difference between epicenter, hypocenter & fault rupture? Why are there several different magnitudes & which ones are the best? How small an earthquake can we measure? How big does an earthquake need to be for a person to feel it? How big does an earthquake need to be to cause damage? When & where was the world’s largest earthquake? What is earthquake intensity (Modified Mercalli scale)? How do we gather intensity information? Where do we see swarms in Southern California? Where else do we see swarms around the world? How can we determine fault orientation & motion from the seismograms? Or what are those little beach balls on all the maps? What magnitude types does SCSN use? How many earthquakes has SCSN recorded since 1932? How many earthquakes do we normally record now per day, week, month etc.? For a comprehensive history of large world-wide earthquakes, in searchable form, see USGS. Each regional seismic network has its own searchable catalog as well. For Southern California, see SCEDC. For the Pacific Northwest, see PNSN. For recent world-wide earthquakes, see USGS. The place to go to report feeling an earthquake or to learn about where it was felt, is DYFI. This site displays intensity information (on the Modified Mercalli Intensity scale, or MMI). See the question below about the intensity scale. A good basic place to start is ECA. Check out their resources: putting down roots in earthquake country, what should I know? and why should I care?. Disaster preparedness information that can be applied to any disaster is available at many, many web sites. You can begin with some of the Earthquake Country Alliance resources. There are many earthquake retro-fit web sites, most of them belonging to contractors who do that sort of work; try a search for someone in your geographic area. Firstly we should define ‘prediction’. To be useful, an earthquake prediction would need to give a relatively accurate date and time of occurrence, as well as a reasonably well-defined geographic area, magnitude range and likelihood (think about the way weather forecasts are given to us). The method should have a proven track record, so that we know the information is areliable. Herein lies the problem; while significant research has been done into earthquake prediction, involving methods such as seismicity statistics, gas emissions, animal behaviour, electromagnetic signals (if you can think of it it’s probably been tried)…, none of these methods have proved reliable. It is now thought that we won’t be able to predict earthquakes any time soon. Rather than aim for prediction, seismologists now develop earthquake forecast models. Rather than a very specific prediction, a forecast is a more general description of the likelihood of an event occurring in a particular place and with a particular magnitude. The kind of information used to build these models includes known fault locations, earthquake recurrence intervals, plate motion rates and observed deformation (from GPS for example). Check out UCERF3 for the latest result. This approach may be a more useful resource for land-use planners, engineers and others concerned with disaster planning than an ‘only possibly accurate’ short-term prediction. Due to the redistribution of mass during a great earthquake, any event with a high enough magnitude could affect the rotational speed, figure and rotation axes. The changes are very small, and similar variations can be caused by atmospheric or oceanic processes. The changes are too small to be detected; rather they have been calculated by modelling the changes to the Earth’s surface caused by the slip during the earthquake. As a general concept, the removal of fluids from the sub-surface can both cause subsidence and trigger seismicity, for example this has been seen at geothermal sites where the hot, underground waters are extracted to generate power. However, whether subsidence and/or seismicity will occur depends on the depths at which the fluids are being extracted, the existing pressure conditions, local geology and the nearby fractures and fault structures. In order to trigger an earthquake of noticeable magnitude, there would need to be a fault nearby that has sufficient tectonic stress across it to fail in an earthquake. The extraction of nearby fluids could then provide a sufficient disturbance to trigger the failure. However, it is not easy to say whether earthquakes will occur or how large a magnitude they could be, although local fault maps will give an indication of seismic hazard. In general, ground water extraction is done from shallow wells (compared, for example, with geothermal or oil extraction wells) which make seismicity less likely as tectonic stresses are lower at shallower depths. There have also been studies linking seismicity rates with rainfall patterns. In California, studies have been published that link variations in creep rates and seismicity on the San Andreas Fault to the hydrologic cycle, rainfall and groundwater recharge. However, being on a plate boundary, tectonics are the strongest control on California seismicity and hazard, with factors like groundwater only having the potential to perturb the underlying natural rates. Aftershocks generally represent the adjustment of the faults to the stress changes caused by the mainshock. Their occurrence therefore depends on how heterogeneous the stress caused by the mainshock was on the slipped fault patch (potentially as a result of fault roughness), or how close to failure nearby/adjacent fault patches are such that they will fail shortly after in smaller events. In the case of the difference between the Banning and Devore earthquakes, it can be inferred that the aftershock occurrence is controlled by structural and material properties on the faults in question, which may also include a depth effect (the Banning event was significantly deeper than the Devore event). This would include factors such as the smoothness of the fault surface, geometry of the faults in the area, geology, presence of fluids, local stresses etc. Notably in the Devore aftershock sequence, some events appear to have occurred on nearby fault segments, not necessarily on the same fault segment as the mainshock. Other general factors that affect aftershock recording (not necessarily all relevant for the relatively small M4 events mentioned here), are the local magnitude of completeness, i.e. are both areas being compared capable of detecting down to the same smaller magnitudes. Here again the depth has an influence, as the detection of smaller events at greater depths may not currently be feasible. During particularly energetic aftershock sequences, small events may also be missed if they are overwhelmed by larger events, but this effect generally only impacts the statistics of aftershocks for larger magnitude events (e.g. M>5). California isn’t falling into the ocean. We sit atop the plate boundary between the North American plate and the Pacific plate, which is a transform (or strike-slip) boundary. As such, the two plates are mainly moving horizontally past each other (rather than towards or apart). The main plate boundary fault is the San Andreas fault, though there are many faults in California that accommodate the plate boundary motion. Los Angeles, San Diego and all areas west of the San Andreas fault are technically sitting on the Pacific plate and are being carried to the northwest toward San Francisco. Look at a map and see that this motion has pulled Baja off the coast of Mexico, a process which has taken about 5 million years. The relative motion between the plates is about 5 cm per year, or 2 inches per year, which is about the rate that your fingernails grow. The question of earthquake triggering is an interesting research topic, and there are a couple of known mechanisms. One phenomena that has been observed is the triggering of small earthquakes due to the passage of the seismic waves from a large event. In some places, the ground is so close to failure (slip on a fault or fracture) that only a small amount of stress is required to make it move. For example, one study found it likely that the M9.3 2004 Sumatra earthquake triggered swarms of smaller magnitude events at significant distances in China, due to the passage of the large surface waves. This mechanism of earthquake-earthquake triggering means that the subsequent events happen in the minutes following the first earthquake, as the waves travel out and around the globe. A second phenomenon is when an earthquake changes the stress state in its immediate neighborhood, leading to further seismicity on the same or nearby faults. In this case, the ground motion resulting from the first event is sufficient to considerably change the state of stress in adjacent regions leading to further failure. The later events may happen within hours, days, months (or perhaps even years) of the first event, but are reasonably spatially close. One concern for Californians is whether Japanese earthquakes will trigger events on the west coast of the US, so we get asked about this whenever Japan experiences a large earthquake. It is certainly possible for the first mechanism I mentioned above to lead to triggered seismicity. California has a few areas with frequent small magnitude seismicity, such as Mammoth, Coso or Brawley, and it would be feasible that a large event in Japan may lead to a minor increase in small magnitude seismicity in those areas. It is less likely to expect Japanese earthquakes to trigger large earthquakes at such distances; there is little evidence for the first mechanism to lead to larger earthquakes, and the distances are too large for the second mechanism to be probable. However, this is still an area of active research so new physical mechanisms for triggering may be hypothesized, or new observations made using the growing seismic data catalogues, so ideas may change in the future. If you look at any raw earthquake catalog, you will find that by far most of the earthquakes listed took place in the last few decades. An earthquake catalog, by the way, is a list of historic earthquakes for a region of the world, made with the idea of having the most complete list possible within the limitations of the area’s seismographic coverage and data processing methods. For this apparent increase in activity, we can thank modern electronics and computers. Many more instruments are installed now than have been so in the past, and the data can be analyzed much more easily. To take the Southern California catalog as an example, many of yesterday’s earthquakes were between magnitude 1.0 and 2.0. These quakes are not large enough for a person to feel. In the 1930’s and 40’s, when the network included fewer than 10 stations, we simply did not record most earthquakes in this size range, so they are not in the catalog. To find out if the number of earthquakes is increasing, we need to search the catalog for only earthquakes as large as the early network was able to detect reliably, which was about M3.3. The number of earthquakes of M3.3 and above per year, on the average, has been about constant since 1932. So, although we have had some pretty spectacular individual years (1933, 1952, 1992, 1994), the number of earthquakes overall does not seem to be increasing. Can animals, some people’s headaches, etc. help predict earthquakes? Throughout history, there have been many anecdotal reports of animals exhibiting unusual behavior prior to large earthquakes. There are a few documented cases of animal behaviour ‘predicting’ earthquakes, mostly in China (for example, the Haicheng earthquake in 1975). However, the earthquakes that were successfully predicted in China had many foreshocks. The animals described may have sensed the foreshocks. In any case, unusual animal behavior can be difficult to interpret. If animals are shown to somehow be able to sense earthquake precursors, instruments are likely to do a more reliable job of it. Every earthquake relieves some stress in the Earth’s crust. However, due to the fact that earthquake magnitude is a logarithmic scale, the small earthquakes do not relieve enough stress to delay a big one by any significant amount. It turns out that a M7.0 releases about 30 times the amount of energy of a M6.0, which in turn releases 30 times the energy of a M5.0, which in turn releases 30 times the energy of a M4.0, and so forth. From this we can see that when we get down to the day-to-day magnitude M2’s and M3’s, the overall energy release is miniscule. We actually observe a relationship between the number of earthquakes and their magnitudes. This is known as the Gutenberg-Richter relation, after it’s discoverers. Approximately, every time we go down in magnitude by a whole point, there are 10 times as many earthquakes. So, over a time period where we have a thousand M3’s, a hundred M4’s and ten M5’s, we would also expect to see one M6 possibly damaging earthquake. Viewed in this way, the small quakes look more like reminders that we live in Earthquake Country than they do stress relief mechanisms! When an earthquake is felt or detected by a seismograph, there was always a patch on some fault that broke and experienced an offset, to cause the seismic waves. If the quake was small, the area of the patch was small and the waves generated were weak. If the quake was large, a large area of fault broke, and so forth. This area of breakage is called the fault rupture. The fault rupture does not all break at once, however. It generally starts at one place and propagates along the fault. The place where the rupture starts is the place that generates the first P and S waves, which are measured by the P picker and used to locate the earthquake, even though it may not represent the whole rupture at all. It is called the hypocenter. The epicenter is the place on the map (or surface of the Earth) directly above the hypocenter. Note that, for a very large earthquake with a large fault rupture, many areas damaged due to being near the fault rupture, may actually be quite far from the epicenter. Also, if the fault dips, or in other words lies at an angle below the ground, the epicenter, on a map, may not be an the surface trace of the fault. ML works well for local earthquakes (within a few hundred km from stations) between about 2.0 and 5.0. If they are too small, the Wood-Anderson does not record them and if they are too large, the pen falls off the paper and gets stuck. We actually do still use ML for most of our day-to-day small quakes, except that, since we don’t use the Wood-Andersons any more, we use synthetic Wood-Anderson records generated in the computer from our digital, broadband seismometers. Mb uses teleseismic (distant) body waves (P and S waves). MS uses teleseismic surface waves with a 20 sec period. Md (duration) and Mc (coda) magnitudes address the tiny earthquakes. The most reliable and physically sensible magnitude, which can be computed for earthquakes over about 4.0, is called moment magnitude Mw and is based on a physical quantity called the seismic moment. Seismic moment can be thought of as an indicator of how much rock moved how far during the quake. To compute seismic moment, we match the whole broadband seismogram at several stations to a computer model of the earthquake. The seismic moment is converted to Mw based on a formula that is intended to match ML, should one be available. Mw differs from the older MS and ML magnitudes significantly for very large earthquakes, since only Mw truly represents the prodigious long period energy these earthquakes produce. For example, the 1964 Alaska earthquake had a MS of 8.4, but a Mw of 9.2, making it the second largest earthquake ever recorded instrumentally. Note that all this sometimes results in multiple magnitudes for the same earthquake. Although the calibrations are such that these numbers should be roughly the same, they often do not agree because they are computed in entirely different ways. It has become customary for the news media to select the largest one and use that as the “Richter scale” reading. Our practice is to use Mw when it appears to be reliable and ML or Md for smaller events. The smallest earthquake magnitude that we can reliably detect, process and list in our catalog is called the detection threshold and it varies from place to place, depending on the areal density of seismic stations, the type of instrumentation and the amount of cultural (man-made) or environmental seismic “noise” that interferes with the detection. In other words, we can locate smaller earthquakes if we have more and more sensitive instruments nearby. Traffic, railroads, trees and radio towers that move in the wind and other factors cause seismic noise. Geologic conditions also affect the sensitivity of a station, with soft sediments introducing the most noise into the records. In most areas of the SCSN, the detection threshold from 1.2 to 1.5, well below the “feelable” threshold. However, in some places where we have very good station coverage we detect earthquakes with magnitudes less than zero. What an earthquake feels like depends on many factors: the magnitude, your distance from the hypocenter (considering the depth of the quake), the type of soil or rock you are on, the building you are in or if you are outdoors and what you are doing at the time. Under ideal conditions, you are lying or sitting still in an upper floor, right on top of a shallow earthquake, you might feel a 1.8 if you were paying attention. Usually, however, it takes at least a magnitude of 2.0 for multiple people to notice a quake and recognize it as a quake. A 4.0 usually gets a lot of public attention if it happens under a populated area. The damage potential of an earthquake also depends on several factors: the magnitude, your distance from the fault rupture (not necessarily the epicenter), directivity effects, soil or rock type, type, age and quality of building construction and various geologic “special cases”. Directivity is a phenomenon related to the direction the fault rupture is propagating. If it is propagating toward you, the seismic waves are stronger and the damage potential greater than the case where it is propagating away from you, even at the same distance from the fault rupture. In general, soft sediment amplifies ground motion, so damage is likely to be worse in geographic basins, as opposed to on rocky mountains or hills at the same distance from the fault rupture. Besides magnitude, however, the most significant factor in damage is the construction of the building itself. Unreinforced masonry (URM) or adobe is by far the worst, since the materials are heavy and weak. Reinforced masonry or “retrofitted” URM buildings are somewhat better, but still may be dangerous. The best is properly built one or two story wood frame construction, anchored to the foundation and with plywood shear walls. Steel frame structures and reinforced concrete structures are usually also resistant to earthquake damage, with age and overall design being a factor. California has historically had problems with URM’s, the 1933 Long Beach earthquake being the most famous example, after which the building code disallowed that type of construction. There have also been problems (1971 San Fernando quake and 1994 Northridge quake) with more modern buildings that are basically boxes on legs. These could be office or classroom buildings designed with an architecturally “open” first floor. They may also be apartment buildings or restored vintage home with parking areas partially underneath the residence. Parking structures also tend to be problematic because they have largely open walls for ventilation & hence no “shear wall” to resist horizontal forces. Elevated freeways have historically caused problems also. Note that in California the building codes and relatively recent construction of most buildings have kept casualties very low in our large earthquakes, the 1906 earthquake being a major exception. Earthquakes in the M5 to M6 range typically don’t cause much damage here, but in some areas of the world such a quake is a major disaster due to traditional dry stone construction or lack of building codes or enforcement of existing building codes. Since earthquakes have been seismographically recorded and magnitudes computed, which is since the late 1800’s, the largest quake was the Mw9.5 Chile earthquake on May 22, 1960. It ruptured a 1,000 km long section of the Andean subduction zone, raised the coastline up to 30 feet in some locations and caused a tsunami that killed people in Hawaii and Japan. In contrast with magnitude, which represents the intrinsic size of an earthquake, intensity relates to information about ground shaking, public perception and damage. Since that varies with location, intensity is normally displayed on a map. The Modified Mercalli Scale has twelve levels, each with a description, generally displayed with Roman numerals to easily distinquish it from magnitude. MMI I means the earthquake was not felt; too small to feel at that location. MMI XII means total destruction (MMI XII is very rare and normally occurs right on top of a fault surface rupture or area of soil liquefaction). For the full list, see USGS. MMI takes into account the different types of building construction, so it represents the strength of the ground shaking at the location. Intensity information used to be gathered largely by mail or by survey teams of engineers inspecting the damage. Results were often available only months after the quake. Currently, felt reports are can be submitted through the Did You Feel It? site, where you can fill out a short questionnaire about what you observed. Intensity maps of recent and historical earthquakes can also be viewed on this site. As quoted above from the USGS Earthquake Hazards Program, a seismic swarm is “A series of minor earthquakes occurring in the same area and time, none of which may be identified as the main shock”. This definition can best be understood as a distinction between a classic mainshock-aftershock sequence and a swarm. Seismologists study the characteristic patterns of seismicity to help understand the underlying behaviour of earth structures and the forces generating earthquakes. From this, various empirical rules have been determined which describe, for example, the magnitude, number and rate of events during aftershock sequences, and this helps us to understand stresses within the earth. The clearest way to show the comparison is by seeing plots of events over time for a classic mainshock-aftershock sequence (Borrego Springs 2016) and a swarm (Bombay Beach 2016). 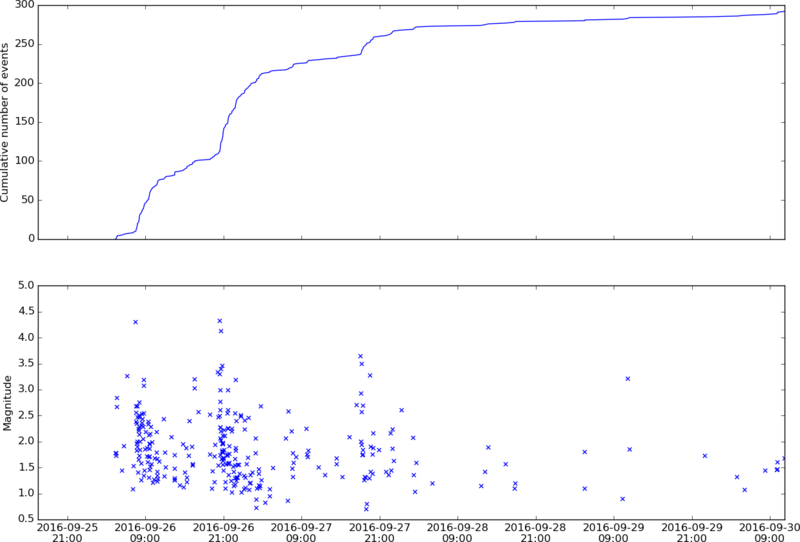 Cumulative aftershock count against time, and magnitude-time distribution of aftershocks of the Borrego Springs 2016 event. Depicting a clear mainshock and subsequent aftershocks indicating an exponential decay in activity after the mainshock. 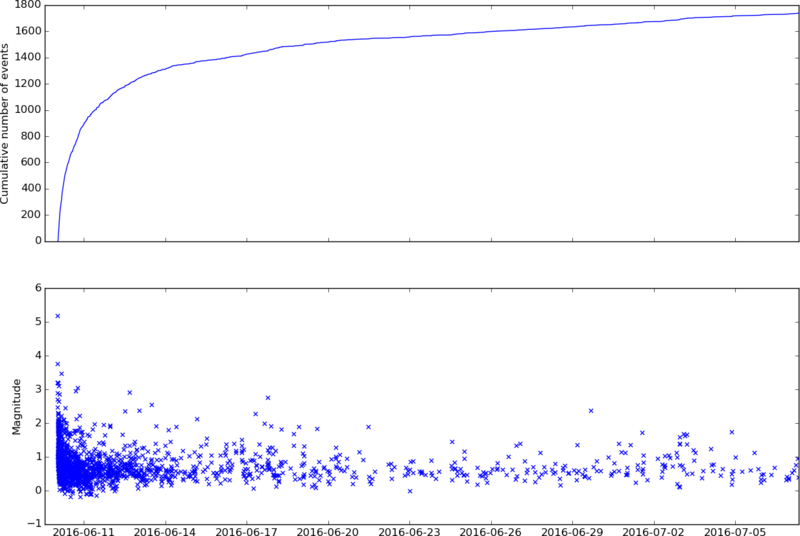 Cumulative aftershock count against time, and magnitude-time distribution of events of the Bombay Beach 2016 swarm. Depicting no clear mainshock, rather 3 large events and surrounded by smaller events with a visibly lower decay rate of activity. By comparing the two sets of graphs it is apparent that swarms are a cluster of earthquakes occurring close together in time and space with no single distinguishable mainshock. Swarms are not defined as having any particular characteristics, and may vary significantly in their magnitude and rate, total event numbers, duration and other features. Swarms in Southern California can happen anywhere that normal seismicity is observed. That being said, certain areas, such as volcanic, hydrothermal, and complexly faulted regions have a higher tendency to produce swarms. These swarms are generally thought to be caused by a cascade of elastic fault rupture, fluid intrusion, or volcanic influence (Vidale and Shearer, 2006). Common areas for swarms within our network include the region of Coso, Anza and Brawley. Direct triggering from previous earthquakes in the region, also called stress loading (Stein, 1999). Local earthquakes always have a small chance of loading extra stress onto a fault causing an eventual rupture or series of ruptures as seen in a swarm. Aseismic slip, commonly called “slow” and “silent” earthquakes, can cause swarms because the crustal materials involved have a lower threshold for strain causing more frequent, or sustained earthquakes than a fault that has been building up energy for a relatively long period of time. Fluid pressure variations, via either hydrothermal or volcanic intrusion can commonly cause swarm activity. When the fluids involved travel along major or minor faults, they change the overall pressure of the associated system causing surrounding materials to fracture and move to accommodate. Likewise, a magmatic intrusion forcing its way through the crust will often cause seismicity for the duration of the movement. These factors can potentially act independently or in conjunction with each other in a wide range of tectonic environments to create earthquake swarms, only indicating that a swarm sequence is in the location of an “underlying geophysical disturbance” (Vidale and Shearer, 2006). We regularly record swarms, simply because we monitor all of the earthquakes in Southern California. We specifically monitor the swarm locations indicated on this page because they are areas of potential and past volcanic activity. Because of the close relationship between swarms and magmatic intrusion it is important to monitor the seismicity in these areas as an indication of the potential onset of volcanic activity. This is also why volcanic observatories around the world primarily monitor earthquake activity; for example visit the Pacific Northwest Seismic Network website to see their plot of earthquakes near volcanoes across Oregon and Washington, or earthquakes recorded by the Hawaii Volcano Observatory. Swarms can occur in almost all tectonic and volcanic environments. Most faults that generally produce classic foreshock-mainshock-aftershock sequences can produce the occasional swarm if the conditions are right. In regions where swarms happen without the presence of major faulting, fluid pressure and magmatic processes can be a cause. So, while swarms can happen anywhere in the world, there are places where the conditions are right for them to be more common. Stein, R.S. (1999). The role of stress transfer in earthquake occurrence, Nature, 402, 605-609. Vidale, J.E., and P.M. Shearer (2006). A survey of 71 earthquake bursts across southern California: Exploring the role of pore fluid pressure fluctuations and aseismic slip as drivers, J. Geophys. Res., 111, B05312, doi:10.1029/2005JB004034. A focal mechanism is a representation of the geographic orientation of the fault that caused an earthquake, based on information from the seismograms. Dip, strike and rake conveniently indicated on a diagram of the focal sphere, which is an imaginary sphere surrounding the hypocenter of the quake. There are two basic types of focal mechanisms available. In a first-motion solution, the direction of the first motion on the vertical seismogram is indicated on the focal sphere, at the location where the ray to that particular station left the hypocenter. “Up” or “compression” first motion indicates that the rock on that side of the hypocenter moved away from the hypocenter first. “Down” or “dilatation” first motion indicates the opposite. There are two possible fault planes, at right angles to each other, for each first motion solution. The preferred one is usually selected based on knowledge of the geology. Examples for each type of fault can be found at USGS. The other type of focal mechanism is part of the moment-tensor solution, which is the best fit to the whole seismogram at several broadband stations. The moment-tensor solution includes the orientation of the fault and motion, as well as the seismic moment, or strength of the earthquake, from which moment magnitude Mw is computed. The same “beach ball” diagram is used to represent the moment tensor. Mw: Our preferred magnitude type, for local earthquakes 4.0 or larger, is moment magnitude Mw. Moment tensor software runs automatically on the real-time system and Mw may be inserted automatically if it passes quality criteria, or it may be inserted later by a seismic analyst. Note that a new earthquake may come up on the Recent Earthquakes maps with its ML, which may be replaced in a few minutes by the Mw, sometimes changing the number slightly. For large historical earthquakes, the Mw inserted into the catalog is usually the Harvard moment tensor solution. ML: Lacking Mw, we currently use local magnitude ML for our local earthquakes. We require several good amplitude readings on at least two stations, however, so ML does not usually work well below about ML2.0. Prior to 1990, ML’s were generated only based on the actual Wood-Anderson seismometers, so they were generally limited to earthquakes above about ML2.5 due to the relatively small number of stations so instrumented. Mh: For current smaller events and for events where there is a problem with the ML and the Mw (such as, for example, multiple earthquakes very close in time), the seismic analyst inserts an “eyeball” magnitude called Mh. Most Mh assignments are based on visual estimates of coda duration. Some may, however, be based on amplitude ratios with other earthquakes at the same location. In the historical catalog (prior to 1992), Mh may have been computed from amplitude readings on helicorder (drum) recordings. Mc: Coda magnitudes were based on an algorithm which fit a decay curve to the S wave coda and estimated the magnitude based on the signal strength on this curve. Mc was used from 1977 through 2000 for earthquakes that lacked an ML or Mw. Md: Md is the standard U.S.G.S. duration magnitude. We used it experimentally in the 1980’s and should be starting to do so again soon. Regional earthquakes: For regional earthquakes (such as northern California) we use the location and magnitude provided by the local network (U.C. Berkeley, U.S.G.S. in Menlo Park, or U. of Nevada Reno). Teleseisms: For teleseismis, we use the location and magnitude from the National Earthquake Information Center (NEIC). As of Jan 1 2015, we had 608,565 local earthquakes (i.e. that had occurred in Southern California). Of these, 20,609 had a magnitude of 3.0 or greater (in other words, might easily have been felt). 242 of them had a magnitude of 5.0 or greater, a size that might cause minor damage if located near poorly built structures. For comparison, as of Nov. 29, 2004, we had 416,165 local earthquakes in the SCSN catalog. In addition to the earthquakes, there are also over 29,000 explosions in the SCSN catalog. These are mostly blasting at local mines and rock quarries, but the total also includes underground nuclear shots at the Nevada Test Site between the late 1950’s and 1992. The number of earthquakes we record over time varies both with the natural fluctuations of seismic activity, and with changes to the sensitivity of our recording network. If we take the four weeks from November 1, 2014 through November 28, 2014 as a very typical “quiet” period of seismicity, we find 812 earthquakes detected and located within the SCSN. Of these, 51 were magnitude 2.0 or larger, of which 6 were 3.0 or larger and one was a 4.1. In other words, at minimum, the SCSN currently detects about 200 earthquakes per week in Southern California, of which 2 or 3 are feelable if they are favorably located with respect to population. If we compare this with the four weeks from November 1, 2004 through November 28, 2004, also a very typical “quiet” period of seismicity, we find 672 earthquakes detected and located within the SCSN. Of these, 82 were magnitude 2.0 or larger, of which 10 were 3.0 or larger and one was a 4.2. At that time, at minimum, the SCSN was detecting about 170 earthquakes per week in Southern California, of which 2 or 3 are feelable if they are favorably located with respect to population. The average between 1990 and 2004 (14 years), however, shows 360 earthquakes detected per week, the difference being due to prolific aftershock sequences from earthquakes in 1992 (Joshua Tree Mw6.1, Landers Mw7.3 and Big Bear Mw 6.3 produce about 100,000 aftershocks in all) and 1994 (Northridge Mw6.7 produced almost 17,000 aftershocks).